Meiotic recombination is a key evolutionary process that promotes genome diversification in sexually reproducing organisms. Recombination shuffles parental genomes through genetic exchanges leading to crossovers (COs) or noncrossovers (NCOs). During meiotic prophase, repair of Spo11-induced DNA double-strand breaks (DSBs) by recombination into COs is crucial for the formation of gametes with normal chromosome content. Indeed, COs ensure a physical link between homologs that allows them to properly segregate to opposite poles during meiosis I division (Hunter, 2015). DSBs occur in excess over COs, so many DSBs repaired as noncrossovers (NCOs), without exchange of flanking sequences. 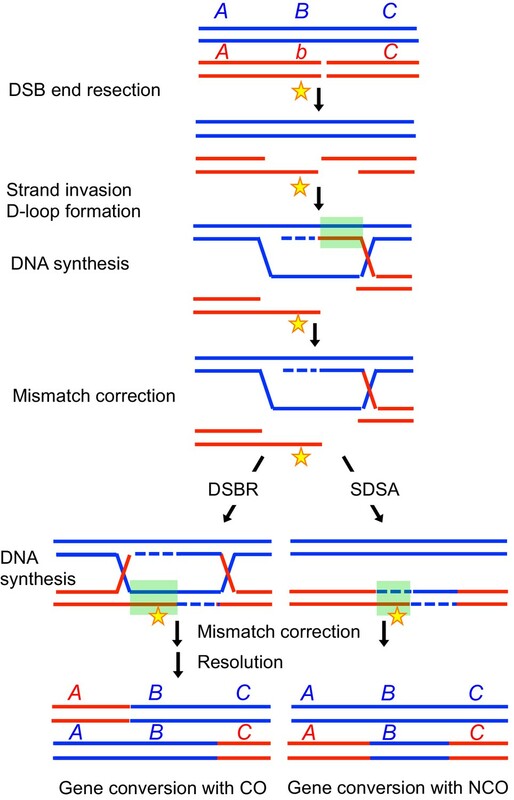 Both COs and NCOs involve the formation of heteroduplex DNA, which can yield gene conversions after mismatch repair (Figure 1). Gene conversions consist of the unidirectional transfer of genetic information from one parental chromosome to the other. Gene conversions therefore result in non-Mendelian segregation and transmission distortion, and also largely contribute to the extinction of recombination-promoting sequences (hotspots) (reviewed in Cole et al., 2012). Despite the importance of gene conversion in promoting genetic diversity, the factors that regulate the extent of sequences converted at each recombination site are not known. Effect of gene conversion during meiotic recombination on allele shuffling and erosion of cis-acting hotspot sequences. Two homologous chromatids are shown in red and blue, the red one having a DSB formed by Spo11. A, B and C represent alleles, with the b allele being present on the red homolog. The star represents a cis-acting hotspot promoting sequence. Following DNA end resection and strand invasion of the intact DNA duplex, the red homolog sequences are copied from the blue one, creating heteroduplexes (indicated by a green square), that are next corrected by mismatch repair, leading either to gene conversion or restoration. After gene conversion, the b allele on the broken chromosome has been converted to the B allele, and the hotspot promoting sequence has been converted to the blue sequence. To repair a subset of DSBs into COs, cells mainly employ a meiosis-specific pathway that ensures an even distribution of COs across the genome (Zhang et al., 2014). For this, after the initial strand invasion of a homologous DNA template by the 3’ end of the resected DSB, the resulting D-loop intermediate is stabilized by a group of proteins called ‘ZMM’, that lead to the single-end invasion (SEI) intermediate (Börner et al., 2004; Hunter and Kleckner, 2001). The ZMM proteins in budding yeast comprise Zip1, Zip2, Zip3, Zip4, Spo16, the Mer3 helicase, and the Msh4-Msh5 heterodimer (Lynn et al., 2007; Shinohara et al., 2008). A proposed function of the ZMM proteins is to protect recombination intermediates from the action of helicases, such as Sgs1 in budding yeast (Jessop et al., 2006; Oh et al., 2007), which may dismantle the joint molecules, leading to synthesis-dependent strand annealing (SDSA) resulting in non-crossovers (Figure 1). These ZMM- stabilized intermediates then mature in double Holliday junctions, which are specifically resolved into COs at the pachytene stage, likely by MutLγ (Allers and Lichten, 2001; Hunter and Kleckner, 2001; Zakharyevich et al., 2012). MutLγ (Mlh1-Mlh3), a heterodimer related to the bacterial mismatch repair MutL complex, forms foci on pachytene mouse, human or plant chromosomes in numbers that correspond to CO numbers. In the absence of MutLγ, CO frequency is reduced in mouse meiosis (Baker et al., 1996; Edelmann et al., 1996; Guillon et al., 2005; Lipkin et al., 2002) as well as in budding yeast (Hunter and Borts, 1997; Nishant et al., 2008). 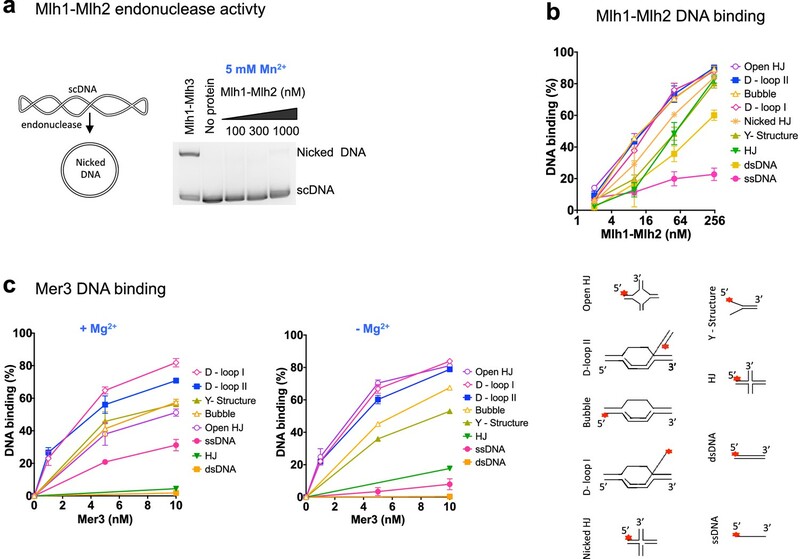 CO remaining in the absence of MutLγ likely result from cleavage of recombination intermediates by alternate structure-specific nucleases (Mus81, Yen1, Slx1-4) that normally play a minor role and are only activated late in the cell cycle (De Muyt et al., 2012; Matos et al., 2011; Zakharyevich et al., 2012). The integrity of the nuclease active site of Mlh3 is required for MutLγ function in CO formation, and MutLγ has thus been proposed to cleave and resolve double Holliday junctions into crossovers (Nishant et al., 2008; Ranjha et al., 2014; Rogacheva et al., 2014; Zakharyevich et al., 2012). 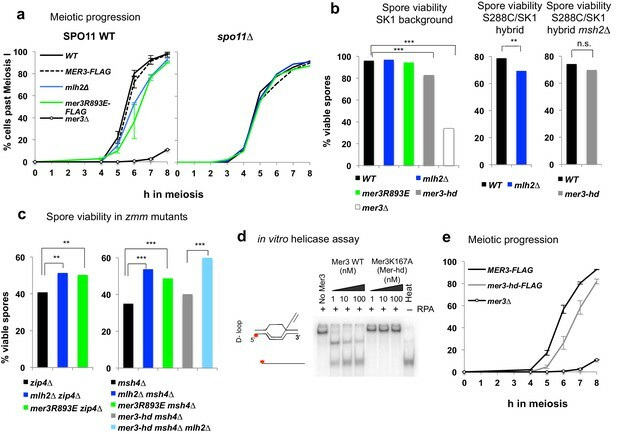 In mismatch repair (MMR), the MutS homologs (Msh2-Msh3 and Msh2-Msh6) are involved in mismatch recognition and recruit either of two MutL heterodimers, MutLα (Mlh1-Pms1 in yeast, MLH1-PMS2 in human) and to a lesser degree MutLγ (Mlh1-Mlh3) (Li and Modrich, 1995; Lipkin et al., 2000; Räschle et al., 1999; Wang et al., 1999). Both MutLα and to a lesser degree MutLγ bear an endonuclease activity that is involved in MMR (Gueneau et al., 2013; Kadyrov et al., 2006). MMR corrects bases misincorporated during replication, but also mismatches formed during homologous recombination (Kadyrov et al., 2006, 2007; Wang et al., 1999). 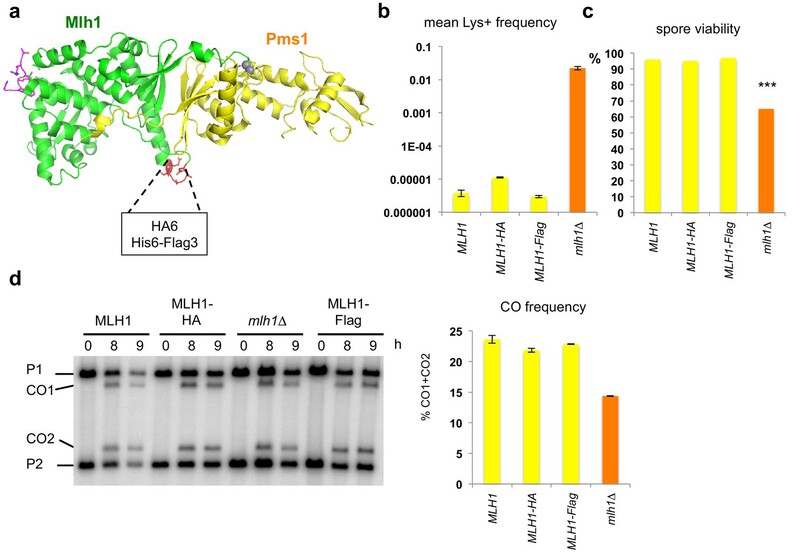 The third MutL heterodimer, Mlh1-Mlh2 (MLH1-PMS1 in mammals) or MutLβ, has an elusive function. No biochemical activity has been described, and the human MutLβ has no MMR activity in in vitro complementation assays (Räschle et al., 1999). Consistently, in mammalian cells, PMS1 deficiency leads to a very small increase in mutation frequency (Prolla et al., 1998). Yeast mlh2∆ cells show no increase in mutation rates, except a slight defect in the repair of a subset of frameshift mutations (Campbell et al., 2014; Harfe et al., 2000). In addition, Mlh2 forms spontaneous Msh2-dependent foci in S-phase that partially co-localize with Pms1, suggesting that MutLβ may be a non-essential accessory factor of MutLα (Campbell et al., 2014). PMS1-/- mice are fertile, suggesting no gross defect in meiotic recombination, contrary to MLH1-/- or MLH3-/- (Prolla et al., 1998). In yeast meiosis, mlh2∆ cells show normal spore viability. However, an increase in conversion of markers flanking several recombination hotspots was observed in mlh2∆ cells (Abdullah et al., 2004; Wang et al., 1999). Here, we used a proteomic approach to identify meiotic partners of Mlh1 in budding yeast. We discovered that MutLβ controls a new regulatory step of meiotic recombination that limits the length of meiotic gene conversion tracts associated with COs and NCOs. This regulation requires a physical interaction between the MutLβ complex and the meiosis-specific helicase, Mer3. This work opens new perspectives to investigate mechanisms that control the genetic diversity created by meiotic recombination. The functionality of Mlh1 is affected when tagged at its N- or C-terminus, which has been a major obstacle for in vivo molecular studies. To obtain a functional tagged allele of Mlh1, we used the crystal structure of the yeast Mlh1-Pms1 C-terminal domain that we previously reported (Gueneau et al., 2013), and chose a solvent accessible loop in the Mlh1 C-terminal domain remote from the endonuclease site and from the Exo1 binding site to insert internal tags and perform molecular studies of Mlh1 complexes during meiotic recombination (Figure 2a). The resulting Flag- and HA- MLH1 tagged alleles were fully functional in mismatch repair (Figure 2b). In addition, in meiosis, both alleles conferred full spore viability, contrary to mlh1∆ (Figure 2c). Finally, both His-Flag- and HA- internally tagged MLH1 alleles produced wild-type frequencies of crossing over at the HIS4LEU2 meiotic recombination hotspot (Figure 2d). We conclude that our internally tagged MLH1 alleles are fully functional and suitable to perform molecular studies of Mlh1 complexes during meiotic recombination. Mlh1 alleles tagged internally in the Cter domain are fully functional for MMR and meiotic recombination. (a) Crystal structure of the C-terminal region of S. cerevisiae Mlh1-Pms1 heterodimer (pdb code 4FM0) (Gueneau et al., 2013). The Mlh1 and Pms1 regions are colored in green and yellow, respectively. The two metal ions of the endonuclease site are represented by grey spheres. The peptide containing the Mlh1-binding motif for Exo1 is colored in magenta. (b) Mutator assay. Frequency of reversion to Lys+ in cells containing the indicated MLH1 genotype at its endogenous locus. Values are the mean of 9 independent colonies ± SEM. (c) Spore viability of diploid SK1 strains bearing the indicated MLH1 genotype at its endogenous locus. MLH1: VBD1311 (188 tetrads), Mlh1-HA: VBD1456 (22 tetrads), Mlh1-Flag: VBD1337 (26 tetrads), mlh1∆: VBD1494 (178 tetrads). ***p<5.10−5, Fisher’s exact test. (d) Crossing over frequency at the HIS4LEU2 hotspot monitored by Southern blot at the indicated times in meiosis. Positions of parental bands (P1 and P2) and of the recombinant crossover products (CO1 and CO2) are indicated. Graph shows quantification at 9 hr from two independent biological replicates ± SEM. Same strains as in (c). To identify Mlh1 partners in meiosis, we performed a Flag pulldown of the Mlh1 complexes in synchronous meiotic cells at 4 hr after induction of meiosis, the expected time of meiotic recombination. As anticipated, we recovered Pms1, Mlh2 and Mlh3, the three known MutL partners of Mlh1. In addition, we recovered the Mer3 helicase of the procrossover ZMM group of proteins (Figure 3a). We confirmed that Mlh1 and Mer3 reciprocally co-immunoprecipitate in meiotic cells using doubly tagged Mlh1-HA Mer3-Flag cells (Figure 3b). 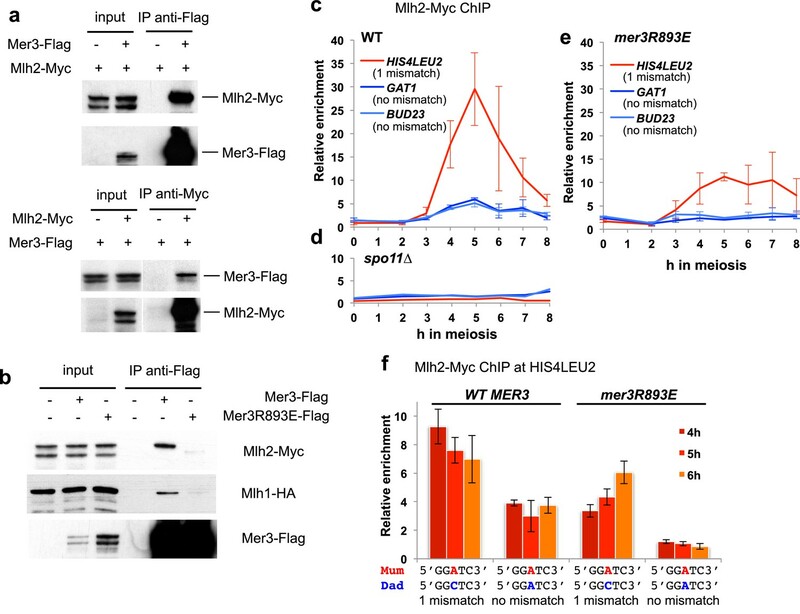 Mlh1 interacts with the meiosis-specific Mer3 helicase. (a) Affinity pull-down of Mlh1-Flag from cells at 4 hr in meiosis. M: marker, No tag: VBD1311, Mlh1-Flag: VBD1337. Left: silver-stained gel of pulled-down proteins. Right: mass-spectrometry analysis of the most significant proteins pulled-down with Mlh1. One representative experiment is shown. (b) Reciprocal co-immunoprecipitation between Mer3-Flag and Mlh1-HA from meiotic cells at 4 hr in meiosis, analyzed by Western blot. Mer3-Flag: VBD1420, Mlh1-HA: VBD1456, Mer3-Flag Mlh1-HA: VBD1454. (c) Comparative analysis of two-hybrid interactions and co-IP in meiotic cells. The domain limits are based on Mer3 modeling with the Mer3 family-related Brr2 helicase structure (Santos et al., 2012). nd: not determined. (d) Co-IP between Mer3-Flag and Mlh1-HA at 4 hr in meiosis, in the presence or absence of MutLβ component Mlh2. Mlh1-HA: VBD1456, Mer3-Flag Mlh1-HA: VBD1454, Mer3∆C-Flag Mlh1-HA: VBD1490, Mer3-Flag Mlh1-HA mlh2∆: VBD1550, Mer3∆C-Flag Mlh1-HA mlh2∆: VBD1552. Moreover, the budding yeast Mer3 and Mlh1 as well as their respective mouse orthologs HFM1 and MLH1 interacted with each other in yeast two hybrid assays, showing that this interaction is evolutionarily conserved (Figure 3c and Figure 3—figure supplement 1a,b). In both species, the C-terminal part of Mer3 was essential and sufficient for the two-hybrid interaction with Mlh1 (Figure 3c and Figure 3—figure supplement 1a,b). However, in meiotic cells, Mlh1 interaction was still observed with Mer3 deleted of its C-terminal part (Figure 3c and d, Mer3∆C). Instead, the Mer3 protein deleted for its IG-like domain (Mer3∆IG) no longer interacted with Mlh1 in meiotic cells, suggesting that a third protein interacting with this region may bridge the in vivo interaction (Figure 3c and Figure 3—figure supplement 1c). 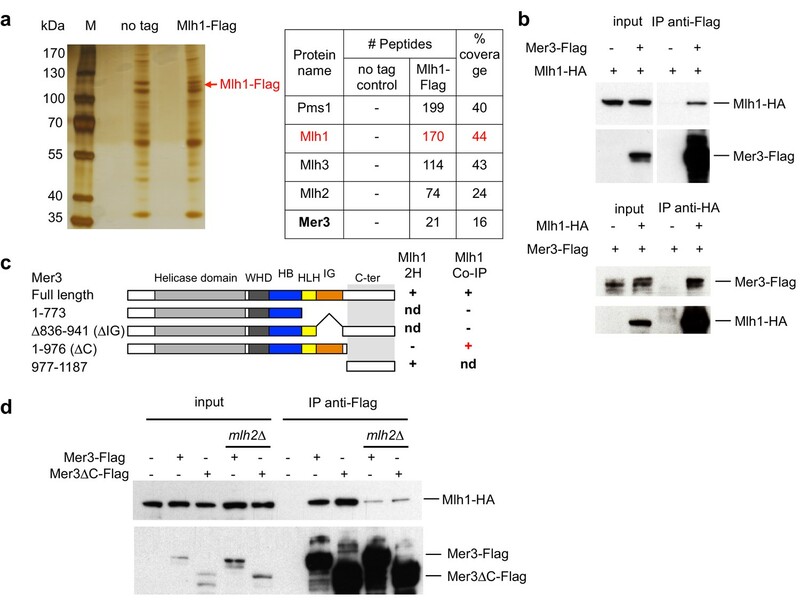 To identify the factor that may help bridge the interaction between Mer3 and Mlh1 in vivo, we performed a Mer3-Flag pulldown from synchronous meiotic cells. Mer3 not only pulled down Mlh1, but also Mlh2, the Mlh1 partner in the MutLβ heterodimer (Figure 3—figure supplement 1d). We found that Mlh2 was important to mediate the interaction between Mlh1 and Mer3 in vivo, indicating formation of a tripartite complex between Mer3 and Mlh1-Mlh2 (MutLβ, Figure 3d). To extend this observation, we further tested for direct interactions using purified proteins. Recombinant Mer3 strongly interacted in vitro with the purified MutLβ complex, showing that the interaction is direct (Figure 4a). Mer3 also interacted with the component Mlh2 protein and also with Mlh1 to a lesser degree (Figure 4b and Figure 4—figure supplement 1). In accord, a direct interaction between Mer3 and Mlh1 could be observed in a yeast two hybrid assay, independent of the presence of Mlh2 (Figure 4—figure supplement 2). However, this interaction does not seem to be sufficient for Mer3 and Mlh1 complex formation in yeast meiotic cells, where Mlh2 is necessary (Figure 3d). Mer3 interacts directly with the Mlh1-Mlh2 (MutLβ) heterodimer. (a) Silver-stained gel showing the direct interaction between purified Mer3 and Mlh1-Mlh2 (MutLβ) complex tagged with MBP on Mlh2. MBP-tagged MutLβ or MBP were bound to amylose resin and incubated with Mer3-His in the presence of 80 mM NaCl. Proteins were eluted with maltose. (b) Western Blot analysis using anti His antibody showing the pulldown of purified Mer3-His by GST-Mlh1 or by MBP-Mlh2 in the presence of 150 mM NaCl. Both panels are from the same exposure time of the same membrane. (c) Structural model of the IG-like domain of Mer3, based on Brr2 helicase structure (Santos et al., 2012). Top diagram: surface of the IG-like domain showing aminoacid conservation, from low (white) to high (red). Bottom: Electrostatic potential indicated by a color code, from positive (blue) to negative (red) charge. The position of Arg893 is indicated. (d) Western Blot showing the pulldown of purified Mer3-His or Mer3R893E-His by MBP-Mlh2 or MBP alone as a control. Pulldown was done in the presence of 150 mM NaCl. (e) Helicase assays with Mer3 or Mer3R893E on labeled D-loop substrate. 'Heat’, heat-denatured DNA substrate indicates the position of ssDNA. Assays were performed with or without RPA (20 nM) as indicated. Importantly, yeast Mer3 and Mlh2, as well as their mouse orthologs HFM1 and PMS1, interacted in a yeast two hybrid assay, showing an evolutionary conservation of the interaction, despite the limited sequence homology between yeast and mammalian Mlh2 (Campbell et al., 2014) (Figure 4—figure supplement 3a,b). We next sought to obtain a mutant of Mer3 that would specifically alter the Mer3-MutLβ interaction. Since Mlh2 seems important for this interaction in vivo, we focused on a mutant of Mer3 that would specifically alter the direct Mer3-Mlh2 interaction. The Mer3 IG-like domain appeared important for Mer3-Mlh2 interaction because: (1) Mer3 protein lacking IG-like domain no longer interacted with Mlh1 in vivo (Figure 3c and Figure 3—figure supplement 1c), (2) the predicted IG-like domain of mouse HFM1 was sufficient for the interaction with PMS1 in the yeast two-hybrid assay (Figure 4—figure supplement 3b) and (3) IG-like domains are often involved in protein-protein interactions. Following principles derived from a statistical analysis of protein complex interfaces (Andreani et al., 2012), a search for conserved aminoacids potentially involved in protein-protein interactions on the surface of the Mer3 IG-like domain suggested a site centered on Arg893 (Figure 4c). We mutated this positively charged residue into a glutamic acid. Remarkably, the interaction between purified Mlh2 and the mutated Mer3R893E protein was strongly diminished (Figure 4d). Importantly, the Mer3R893E mutated protein kept its DNA binding and helicase activity intact (Figure 4e and Figure 4—figure supplement 4a). Consistent with the loss of interaction between purified Mer3 and Mlh2 proteins, the Mer3R893E protein was unable to interact with Mlh2 in yeast two hybrid test, while keeping its interaction with Mlh1 (Figure 4—figure supplement 4b and Figure 4—figure supplement 2). We next tested the effect of the Mer3R893E mutation on the Mer3 interaction with MutLβ in meiotic cells. Consistent with the direct interaction between recombinant proteins, Mer3 and Mlh2 were able to reciprocally co-immunoprecipitate each other and Mer3 co-immunoprecipitated both Mlh1 and Mlh2 (Figure 5a and b). 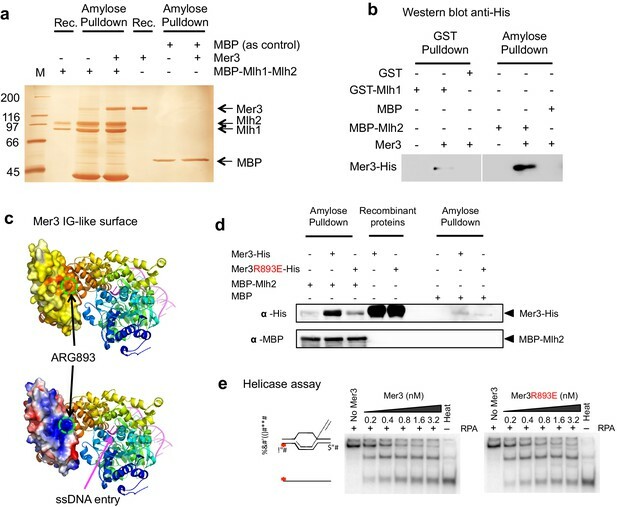 The Mer3R893E protein instead no longer interacted with Mlh2 or Mlh1 in meiotic cells, confirming the critical role of the Mer3-Mlh2 interaction in a complex formation between Mer3 and the MutLβ heterodimer in vivo (Figure 5b). Mlh2 binds meiotic recombination intermediates. (a) Reciprocal co-IP between Mer3-Flag and Mlh2-Myc from meiotic cells at 4 hr in meiosis, analyzed by Western blot. Mer3-Flag: VBD1420, Mlh2-Myc: VBD1628, Mer3-Flag Mlh2-Myc: VBD1670. (b) Co-IP between Mer3- or Mer3R893E-Flag and Mlh2-Myc or Mlh1-HA from meiotic cells at 4 hr in meiosis, analyzed by Western blot. Mlh1-HA Mlh2-Myc: VBD1630; Mer3-Flag Mlh1-HA Mlh2-Myc: VBD1629; Mer3R893E-Flag Mlh1-HA Mlh2-Myc: VBD1681. (c) Mlh2-Myc levels at three meiotic recombination hotspots assessed by ChIP and qPCR at the indicated times during a meiotic time-course (VBD1670). (d) Same as in (c) but in a DSB-deficient spo11∆ strain (VBD1702). (e) Same as in (c) but in the mer3R893E strain (VBD1637). (f) Effect of polymorphism at the HIS4LEU2 hotspot on Mlh2 binding. Mlh2-Myc association with the HIS4LEU2 hotspot was assessed by ChIP at the indicated times in meiosis in strains containing either the wild-type or R893E mer3 allele, in strains with one base mismatch or without a mismatch at the HIS4LEU2 hotspot. WT one base mismatch: VBD1670; WT no mismatch: VBD1710; mer3R893E one base mismatch: VBD1637; mer3R893E no mismatch: VBD1706. (c), (e) and (f): Values are the mean ± SEM from two independent experiments. Overall, our data demonstrate that in yeast the interaction between Mer3 and Mlh1 is weak, whereas the interaction between Mer3 and Mlh2 is stronger, and required for the complex formation between Mlh1 and Mer3 in vivo. In contrast, for mouse proteins, the interaction between HFM1 and MLH1 is very strong, compared to that between HFM1 and PMS1. In both systems however, Mer3/HFM1 forms a complex with the MutLβ heterodimer. As anticipated from a protein interacting with Mer3, Mlh2 associated with meiotic DSB hotspot sites, at the time of recombination, in a Spo11 DSB-dependent manner (Figure 5c and d). Remarkably, Mlh2 association with the BUD23 and GAT1 hotspots no longer occurred in the mer3R893E mutant, implying that Mer3 recruits Mlh2 to these sites (Figure 5e). Surprisingly, Mlh2 recruitment to the HIS4LEU2 hotspot was reduced, but not eliminated (Figure 5e). The HIS4LEU2 hotspot contains one base polymorphism between the two alleles (Hunter and Kleckner, 2001; Martini et al., 2006), which potentially creates a mismatch during interhomolog recombination and the formation of a D-loop intermediate (Figure 5f). Interestingly, eliminating the polymorphism at the HIS4LEU2 hotspot reduced Mlh2 recruitment, which was abolished when combined with the mer3R893E mutation (Figure 5f). Consequently in msh2∆ cells, Mlh2 recruitment to the two hotspots BUD23 and GAT1 was not affected, but it was reduced at the polymorphic HIS4LEU2 hotspot (Figure 5—figure supplement 1). All together, our results show that the mode of recruitment of Mlh2 through interaction with Mer3 does not require a mismatch. If a mismatch is formed during recombination between heteroalleles, Mlh2 is recruited, independently of Mer3, most likely by Msh2. Unlike Mlh3 and Pms1, Mlh2 lacks the conserved endonuclease motif characteristic for the eukaryotic MutL family of proteins (Campbell et al., 2014; Kadyrov et al., 2007; Ranjha et al., 2014; Rogacheva et al., 2014). In agreement, Mlh1-Mlh2 was deficient in an endonuclease assay (Figure 6a). We next investigated whether the MutLβ complex binds various DNA structures. Mlh1-Mlh2 preferred binding to pre-Holliday junction (HJ) structures, namely D-loop and bubbled substrate, whereas the binding affinity to nicked HJ, Y-structure and HJ was lower (Figure 6b and Figure 6—figure supplement 1). Binding to dsDNA was ~8.5 times lower than to D-loops, while ssDNA was almost not bound. We next investigated the DNA binding specificity of Mer3. Previous studies indicated that Mer3 binds equally double-stranded DNA and Holliday Junctions (Nakagawa and Kolodner, 2002a). We determined that purified Mer3 showed a striking preference for binding D-loop structures over all other substrates, and efficiently unwinds D-loops, consistent with its proposed role on this intermediate (Figure 6c). The stronger affinity of Mer3 to D-loops compared to that of MutLβ is also consistent with our findings that Mer3 is required for the recruitment of MutLβ to these intermediates in vivo. Collectively, these results suggest a non-catalytical function of MutLβ on early recombination intermediates. Recombinant Mer3 and MutLβ preferentially bind DNA substrates mimicking early recombination intermediates. (a) Nuclease assay was performed with Mlh1-Mlh2 (as indicated) or Mlh1-Mlh3 (300 nM) on the indicated super-coiled circular plasmid DNA substrate (scDNA). Mlh1-Mlh3 is shown as a positive control producing nicked circular DNA (b) Quantitation of electrophoretic mobility shift assays with Mlh1-Mlh2 and various oligonucleotide-based DNA substrates in the presence of magnesium (2 mM). Values are the mean ± SEM from two independent experiments. (c) Electrophoretic mobility shift assays with Mer3 and the indicated DNA substrates, in the presence of either 2 mM magnesium (+Mg2+) or 3 mM EDTA (–Mg2+). Values are the mean ± SEM from two to tree independent experiments. We next investigated the role of the Mer3-Mlh2 interaction in meiotic recombination. mlh2∆ or mer3R893E cells progressed through the first meiotic division with a delay compared to a wild-type strain. In addition, this delay was dependent of the presence of DSB (Figure 7a). In the SK1 background, both mutants formed viable spores and showed normal CO frequency at the HIS4LEU2 hotspot (Figure 7b and Figure 7—figure supplement 1). However, in a hybrid SK1/S288C background, spore viability was significantly reduced in both mlh2∆ and in mer3R893E mutants (Figure 7b and Figure 8—figure supplement 1d). 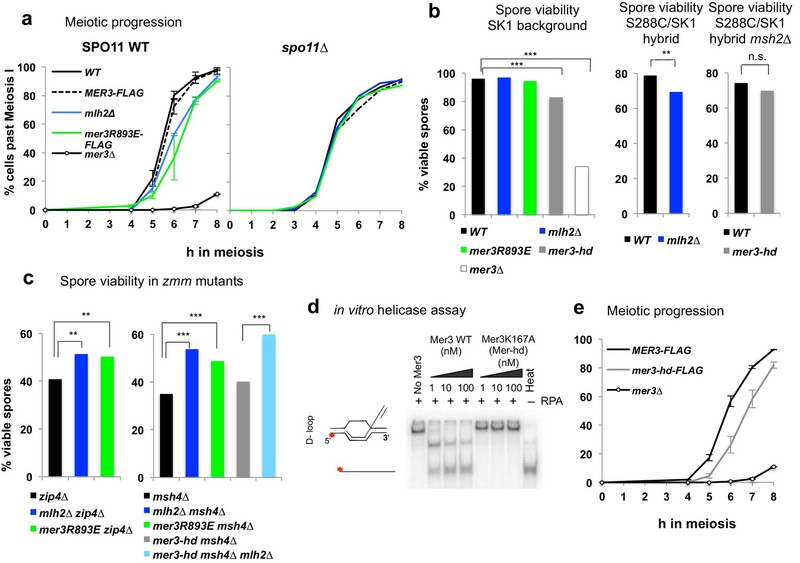 Together, the DSB-dependent delay of meiotic progression and the loss of spore viability indicate that mlh2∆ and mer3R893E mutants have a meiotic defect due to a defect in DSB repair. Disruption of the Mlh2/Mer3 interaction improves spore viability of zmm mutants. (a) Meiotic progression as assessed by DAPI staining of strains with the indicated genotype: WT (VBD1311), Mer3-Flag (VBD1420), mlh2∆ (VBD1631), Mer3R893E-Flag (VBD1635), mer3∆ (VBD1414), spo11∆ (VBD1382), spo11∆ Mer3-Flag (VBD1794), spo11∆ mlh2∆ (VBD1796), spo11∆ Mer3R893E-Flag (VBD1795). (b,c) Spore viability assays of strains with the indicated genotype. Fisher’s exact test, **p<5.10−3; ***p<5.10−5; n.s. : p>0.05. Numbers of tetrads dissected and strains names are in Supplementary file 1. (d) Helicase assays with recombinant Mer3 or Mer3K167A in the presence of 20 nM RPA on a D-loop substrate. 'Heat’, heat-denatured DNA substrate indicates the position of ssDNA. (e) Meiotic progression as assessed by DAPI staining of strains with the indicated genotype: Mer3-Flag (VBD1420), Mer3-hd-Flag (VBD1750) or mer3∆ (VBD1414). (a), left panel and (e): Values are the mean ± SEM from two independent experiments. The ZMM proteins Zip4 and Msh4 are important for CO formation, and their deletion leads to a decrease in both CO frequencies and spore viability. Strikingly, both the mlh2∆ and the mer3R893E mutations improved the spore viability of the zip4∆ and msh4∆ mutants (Figure 7c), which had already been noticed for the mlh2∆ msh4∆ mutant compared to msh4∆ (Abdullah et al., 2004). Increased spore viability may result from an increased capacity of these mutants to make crossovers. However, the deletion of MLH2 did not lead to a detectable increase of CO frequency at the HIS4LEU2 hotspot in zip4∆ or msh4∆ mutants (Figure 7—figure supplement 1). This indicates that either the spore viability increase is not related to an increase in CO, or that a subtle increase below the detection limit of our assay may be sufficient to increase spore viability. Noteworthy, our results show that the meiotic phenotypes of mlh2∆ and mer3R893E mutants are identical, indicating that the meiotic functions of Mlh2 are exerted through its interaction with Mer3. Since abolishing the interaction between Mer3 and Mlh2 compensates partially the viability defects of zmm mutants, we asked if and how it affects recombination intermediates. 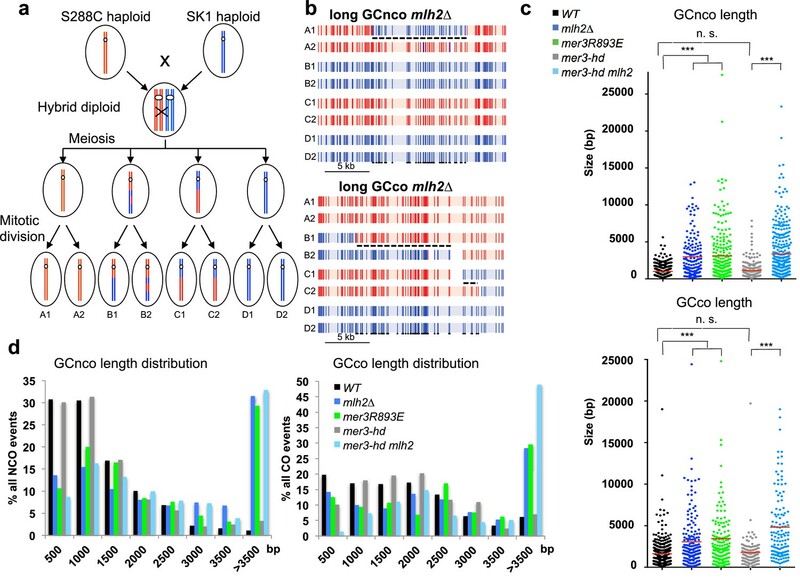 To get a precise genome-wide view of recombination intermediates, we sequenced all the eight DNA strands resulting from meioses of S288C*SK1 hybrid diploids. The msh2∆ mutation present in this hybrid allows the detection of virtually all interhomolog recombination events, since most DNA heteroduplexes (hDNA) formed during recombination between polymorphic parental sequences are maintained due to MMR deficiency, whereas they would lead to gene conversions or restorations of the parental alleles in the MSH2 background (Figure 8a) (Martini et al., 2011). For simplicity, we will refer to all the strand transfer events that we observed, either hDNA or gene conversions, as ‘gene conversion tracts’. In this hybrid diploid, CO frequency appeared reduced by about 25% in mlh2∆ and in mer3R893E, although these measurements have to be taken with caution since they are issued from 2 (WT and mlh2∆) or 3 (mer3R893E) meioses of each genotype (Figure 8—figure supplement 1a). COs promoted by the ZMM pathway exhibit interference, i.e. the tendency to be evenly spaced, whereas COs promoted in the absence of the ZMM pathway do not (Hunter, 2015). We estimated CO interference from the distribution of the inter-CO distances measured in our genome-wide experiments, using a gamma distribution model as previously described (Chen et al., 2008). Consistent with previous findings, we obtained a gamma value of 2.3 for wild-type. mlh2∆ and mer3R893E cells showed gamma values of 2.5 and 1.9, respectively, indicating that CO interference still occurs, as opposed to values between 1.1 and 1.2 observed in true zmm mutants (Chen et al., 2008). This indicates that mlh2∆ and mer3R893E mutants still use the ZMM pathway for CO formation as wild-type cells (Figure 8—figure supplement 1b). The Mlh2/Mer3 interaction limits the extent of gene conversions genome-wide. (a) Scheme of the experimental system to measure genome-wide recombination events. After meiosis, the four haploid spores were allowed to perform one mitosis and micromanipulated, in order to sequence DNA of the two daughters, allowing the recovery of the 8 DNA recombined strands from the initial diploid cell. (b) Blow up of NCO and CO events of a mlh2∆ meiosis, showing very long hDNA tracts (referred to as GC, or gene conversions) more frequent in this mutant. The 8 strands are shown. Each vertical bar represents a nucleotide polymorphism between the two strains (blue: of SK1 origin; red: of S288C origin). (c) Gene conversion lengths among NCO and CO events of meioses from the indicated genotype. The horizontal bar indicates the mean value of all events from the meioses (4 meioses of WT, and 2 meioses of each other relevant genotype). Wilcoxon rank sum test, ***p<5.10−5. n.s. : p>0.05 (d) Distribution of gene conversion lengths among NCO and CO events of meioses each from the indicated genotype. Strikingly, the length of both CO- and NCO- associated conversion tracts strongly increased in mlh2∆ and mer3R893E mutants (Figure 8b). Tracts associated with a CO went from a median length of 1.0 kb in wild-type to 2.1 kb (mlh2∆) and 2.3 kb (mer3R893E) and tracts associated with NCO went from 0.8 kb to 2.3 kb (mlh2∆) and 1.7 kb (mer3R893E) (Figure 8c). In particular, very long tracts larger than 10 kb occurred in both mutants and a large proportion of events spanned longer than 3.5 kb in length (Figure 8d). Apart from the extended length of gene conversion tracts, no striking change in the nature of the events occurred in the mlh2∆ and mer3R893E mutants. The two major categories of NCO events, defined depending on the associated strand transfer patterns, occurred with the same frequency as in wild-type and showed a similarly increased length in both mutants (Figure 8—figure supplement 1c) (Martini et al., 2011). We conclude that the interaction between Mer3 and Mlh2 is essential to limit the length of conversion tracts genome-wide, both at CO- and NCO-designated events, without affecting the repair outcome. Genetic and biochemical evidence suggests that Mer3 extends early recombination intermediates to stabilize them to promote CO formation (Börner et al., 2004; Mazina et al., 2004). We wondered if the long extension of conversion tracts seen in the absence of Mer3-Mlh2 interaction is due to the helicase capacity of Mer3 itself. Based on its in vitro helicase activity, Mer3 should extend the D-loop in the direction opposed to DNA synthesis, resulting in a type of recombination product called symmetrical heteroduplex (Figure 8—figure supplement 2) (Mazina et al., 2004). However, neither the frequency nor the length of these events, very rare in wild-type, was increased in the mutants [WT: 560 bp (11 events in 4 meioses), mlh2∆: 644 bp (7 events in 2 meioses), mer3R893E: 434 bp (8 events in 2 meioses)], arguing against Mer3 extending D-loops in this direction in the absence of interaction with Mlh2. We therefore directly tested the involvement of the Mer3 helicase activity in the increase of conversion tract length by making a strain containing the mer3K167A (mer3-hd) mutation, which abolishes Mer3 helicase activity (Figure 7d) (Nakagawa and Kolodner, 2002b). Surprisingly, genome-wide mapping of recombination events clearly showed that (1) the length of conversion tracts was identical to wild-type in the mer3-hd mutant, (2) the length of conversion tracts was still strongly increased when deleting MLH2 in the mer3-hd mutant, showing that the helicase of Mer3 is not involved in the increased length of events seen in the absence of Mer3-Mlh2 interaction (Figure 8c and d). In further support of this, the mer3-hd mutation did not impact on the increased spore viability of the mlh2∆ msh4∆ double mutant, unlike the mer3∆ mutation (Figure 7c and Supplementary file 1). We conclude that the phenotypes of mlh2∆ (increased viability of zmm mutants and increased length of gene conversion tracts) are not due to Mer3 helicase activity. Surprisingly, the mer3-hd mutant also still displayed an almost intact ‘ZMM’ function, with high spore viability and only a short delay in meiotic progression, as opposed to the mer3∆ mutant (Figure 7b and e) (Jessop et al., 2006). CO numbers in the mer3-hd hybrid mutants were decreased compared to the wild-type or the single mlh2∆ mutant, but less than would be expected from a zmm mutant as determined from previous studies (Chen et al., 2008; Oke et al., 2014) (Figure 8—figure supplement 1a). Mer3 thus fulfills its early function (controlling gene conversions length) and most of its later ZMM functions (meiotic progression, spore viability and CO formation) independently of its helicase activity. In this study, we show that the MutLβ complex is specifically recruited to meiotic recombination sites by the Mer3 helicase, and shows the unique ability to limit the length of gene conversions genome-wide. This regulation may be conserved in mammals since the Mer3-MutLβ interaction is conserved between the mouse proteins. This has important implications for the control of genome diversity created by gene conversion in meiosis. The recombination signature of the mlh2∆ or mer3R893E mutants shows that hDNA is extended mainly in the direction of DNA synthesis. We show that the MutLβ-Mer3 complex stops D-loop extension and associated DNA synthesis, limiting gene conversion tract length. Strikingly, even if the Mer3 helicase activity is not involved, the long hDNA extension seen in mlh2∆ seems to require a structural function of Mer3, since mlh2∆ does not improve spore viability of the zip4∆ mutant in the absence of Mer3 (Supplementary file 1). Based on our findings, we propose the following model (Figure 9): (1) Mer3 binds D-loop intermediates, thanks to its preferential affinity for this substrate and induces a structural change making it able to migrate and (2) Mer3 recruits MutLβ, which also preferentially binds D-loop structures. The formed Mer3-MutLβ complex acts as a lock to physically block the overextension of recombination intermediates. (3) Mer3 then exerts its later functions, involving its helicase activity in conjunctions with the other ZMM proteins to form crossovers. In the absence of Mlh1-Mlh2, the Mer3-bound D-loop is over-extended by the action of DNA polymerase. The next steps proceed as in wild-type involving later functions of Mer3 for CO formation. The resulting meiotic products show a large increase of gene conversions tracts length at all recombination sites. Model for the actions of Mer3 and MutLβ on recombination sites. Following DSB formation and strand invasion, Mer3 (in orange) binds the resulting D-loop and DNA synthesis begins (dotted blue arrow). MutLβ (light blue and yellow complex) interaction with Mer3 then acts as a lock to stop D-loop extension in DNA synthesis direction (left panel). In the absence of Mlh2, D-loop will extend significantly further in the DNA synthesis direction (right panel). After this step, Mer3 is expected to have other, procrossover functions, partly dependent on its helicase activity, acting together with the other ZMM proteins and MutLγ. Grey arrows indicate that endonuclease activity should remove the flap generated by overextension of the D-loop in the absence of MutLβ. The light green rectangles indicate the gene conversion tracts, longer in the absence of MutLβ. Null mutants of MER3 show meiotic defects typical for the ZMM proteins. Specifically COs, but not NCOs, are reduced, likely as a result of less stable early recombination intermediates (Börner et al., 2004; Jessop et al., 2006). These results placed Mer3 as a procrossover factor acting in the main CO pathway that displays CO interference. However, since both CO- and NCO-associated conversion tracts are longer in the mer3R893E mutant, and since Mer3 preferentially binds D-loop intermediates, a common precursor to all recombination events, our results uncover a new early function of Mer3. This infers that Mer3 has a function on D-loop intermediates, irrespective of their fate. This Mer3 function is independent of its ‘ZMM’ and procrossover functions, since the mer3R893E mutation does not affect meiotic progression or CO frequencies. Previous cytological data in Sordaria macrospora and in rice showed the presence of Mer3 foci at early leptotene and in much higher numbers than COs, also suggesting an early function of Mer3 in these organisms (Storlazzi et al., 2010; Wang et al., 2009). Our results showing that Mer3 fulfills most of its early and late functions independently of its helicase activity appear to contrast with previous reports that proposed that the helicase of Mer3 is important to extend and stabilize recombination intermediates at future CO sites (Mazina et al., 2004; Nakagawa and Kolodner, 2002b). Although the Mer3 helicase activity seems to be involved in promoting normal CO frequency, we reveal that Mer3’s ZMM function is largely non-catalytical, and may involve the recruitment of additional ZMM proteins to stabilize recombination intermediates (Börner et al., 2004). 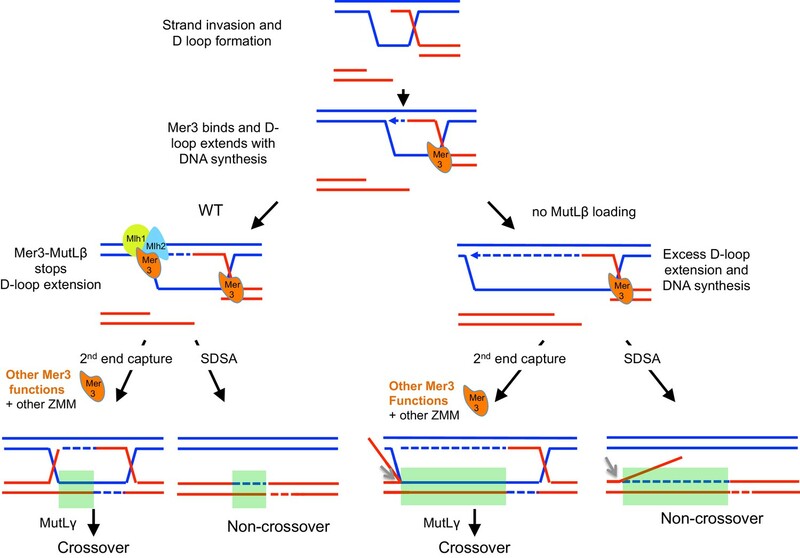 MutLβ is recruited to recombination sites through mismatch recognition and Mer3. However, these recruitment modes are not redundant. Recruitment through mismatches does not restrain GC tract length as seen in the mer3R893E mutant (Figure 5f), and MutLβ efficiently restrains GC tract length in the absence of Msh2. This shows that MutLβ participates in two distinct processes at recombination sites. The novel structural rather than catalytical role of MutLβ that we described here is in contrast with its MutLα and γ relatives, which require nuclease activities for their functions (Kadyrov et al., 2007; Nishant et al., 2008). In addition, our findings provide a role for MutLβ, which has been elusive for almost 30 years, and show that MutLβ is the only MutL complex that functions independently of a MutS-related heterodimer (Manhart and Alani, 2016). Interestingly, a recent comparative genomics study revealed that Mlh2 is lost concomitantly with the ZMM proteins in the Lachancea budding yeast clade, consistent with the functional connection we describe here (Vakirlis et al., 2016). It is also interesting that in vegetative budding yeast cells, mlh2∆ mutants show higher resistance to DNA damaging drugs, which led to the proposal that MutLβ could inhibit Rad51-dependent recombination (Durant et al., 1999). Perhaps a mechanism similar to the one we describe for meiosis is at play, in which MutLβ limits the formation of early recombination intermediates. Its deletion would favor the stabilization of early recombination intermediates and homologous recombination. It is worth noticing that in human cells, PMS1 (the Mlh2 homolog) interacts with several helicases (Cannavo et al., 2007). The functionality of these interactions has not been determined yet. Finally, our study reinforces the tight links that exist between homologous recombination and mismatch repair related MutL complexes. It is fascinating that two of the three MutL complexes are an integral part of the meiotic homologous recombination process. Since MutLβ and MutLγ both contain Mlh1, our results also reveal an unprecedented early role of Mlh1 at meiotic recombination intermediates, within the MutLβ complex. Mlh1 is classically used as a cytological marker of crossovers in several organisms such as mammals, where it forms foci on synapsed homologs, but given the conserved interaction between Mer3 and MutLβ in mammals, careful examination may reveal earlier Mlh1 foci on meiotic chromosomes, as early as in leptotene/zygotene stage. We did not detect a pronounced effect of the over-extended recombination intermediates on CO frequency. Regarding the proposed role of extending the D-loop into a single-end intermediate for promoting COs, one could have expected mlh2∆ or mer3R893E mutant to produce more COs, because a longer intermediate would be resistant to disruption by helicases (De Muyt et al., 2012). However, CO number in budding yeast and other organisms is highly regulated, especially by CO interference, which limits crossovers (Hunter, 2015). Since interference is still fully active in the mlh2∆ and mer3R893E mutants, we infer that the CO decision is made before or irrespective of the extension of joint molecules in the absence of Mlh2. There are other examples of mutants, which affect the length of D-loops but have no effect on CO frequency. An exo1 nuclease-dead mutant displayed reduced DNA end resection length, which was expected to form shorter, less stable D-loops, but in contrast no change in CO frequency was observed (Zakharyevich et al., 2010). This ‘buffering’ effect may be related to the phenomenon of crossover homeostasis, which maintains CO numbers, even in compromised recombination contexts (Lao et al., 2013; Martini et al., 2006). Why would meiotic cells limit the extent of sequences involved in gene conversions? Strikingly, gene conversion tracts are much longer in S. cerevisiae somatic recombination than in meiosis (Yim et al., 2014), consistent with the meiosis-specific nature of the negative regulation by Mer3-MutLβ. Compared to somatic recombination, a specificity of meiosis is the simultaneous induction of high numbers of programmed DSBs, potentially very dangerous for genome integrity and that need to be controlled. It may be detrimental for pairing and/or chromosome disentangling to expose too long DNA sequences, or to run into functional elements such as centromeres or the sequences that attach chromatin loops to the meiotic chromosome axis. In Sordaria meiosis, Mlh1 mutants show an increased frequency of entanglements, suggesting a function at an earlier stage than crossover resolution (Storlazzi et al., 2010). These may be related to the over-extension of D-loops that we see in the absence of MutLβ and its interaction with Mer3. Interestingly, limiting gene conversion specifically in meiosis may also serve the purpose of avoiding, in the long term, breaking of ancestral linkage groups of favorable combination of alleles and homogenizing alleles in a population that may occur when DSB formation is more frequent on one allele (Figure 1; reviewed in (Cole et al., 2012). In addition, in human and mice, recombination is initiated at site-specific sequences, which could be frequently erased by conversion tracts, leading to the rapid extinction of hotspots, in the absence of a limiting mechanism (Baudat et al., 2013; Cole et al., 2014). All yeast strains are derivative of the SK1 background except otherwise stated and are listed in Supplementary file 2. A table that links strains to figure panels is provided in Supplementary file 3. For synchronous meiosis, cells were grown in SPS presporulation medium and transferred to 1% potassium acetate with vigorous shaking at 30°C as described (Murakami et al., 2009). For S288C*SK1 hybrid sporulation, cells were grown overnight in YPA presporulation medium, and then transferred to liquid 1% potassium acetate. Tetrads were dissected, and daughter and mother cells from each spore were separated by micromanipulation as described (Martini et al., 2011). For all strains, spore viability was measured after sporulation on solid sporulation medium for two days at 30°C. Yeast strains were obtained by direct transformation or crossing to obtain the desired genotype. Site directed mutagenesis, internal and C-terminal deletions were introduced by PCR. All transformants were confirmed using PCR discriminating between correct and incorrect integrations and sequencing for epitope tag insertion or mutagenesis. For Mlh1 internal tagging, the indicated HA6 or His6-Flag3 tag sequence, flanked on each side by the GGGGSGGGGS linker sequence, was inserted between aminoacids 710 and 713 of Mlh1. Mlh2 was C-terminally tagged with 13 copies of Myc (Longtine et al., 1998). The tagged Mlh2-Myc protein was functional since a zip4∆ Mlh2-Myc strain showed the same spore viability as a zip4∆ mutant, in contrast to a zip4∆ mlh2∆ mutant (Supplementary file 1). The His6‐Flag3 epitope, preceded by a GGGGSGGGGS linker sequence, was fused to the C‐terminus of MER3, using plasmid pU6H3FLAG (a gift from Kunihiro Otha). The mer3R893E mutation in the S288C*SK1 hybrid was obtained by CRISPR-Cas9 mediated cleavage, using a plasmid encoding Cas9 and expressing a guide RNA targeted to the MER3 gene (plasmid generously provided by G. Zhao and B. Fetcher) transformed together with a healing mer3 fragment containing the R893E mutation. Mutation rates in the presence of tagged MLH1 alleles were estimated by measuring the spontaneous reversion rate at the lys2::InsE-A14 locus in strains derived from E134 (Shcherbakova and Kunkel, 1999; Tran et al., 1997). Three single colonies from three independent transformants of the same genotype were grown to stationary phase in liquid YPAD medium and plated onto YPAD or selective medium lacking lysine for revertant count. MLH1, MLH2 and MLH3 ORFs were PCR-amplified from SK1 genomic DNA. MER3 cDNA sequence was amplified from SK1 genomic DNA by fusion of 2 PCR products eliminating MER3’s intron. Full length mouse HFM1, MLH1, MLH3 cDNA were amplified from plasmids (obtained from Genscript, Genocopia and Genocopia, respectively) and PMS1 was PCR-amplified from mouse testis cDNA, a gift from J. Barau and D. Bourc’his. PCR products were cloned in pDNOR Gateway plasmids and subcloned in Gateway plasmids derived from the two hybrid vectors pGADT7 (GAL4-activating domain) and pGBKT7 (GAL4-binding domain) creating N terminal fusions (gift from M. Grelon). Point mutations, truncations or internal deletions were introduced by PCR. All plasmid inserts were sequenced. 2.1010 cells were harvested, washed two times with ice-cold TNG buffer (50 mM Tris/HCl pH 8; 150 mM NaCl, 10% Glycerol; 1 mM PMSF; 1X Complete Mini EDTA‐Free (Roche)) and flash-frozen in liquid nitrogen. Frozen cells were mechanically ground in liquid nitrogen. The resulting powder was resuspended in 50 mL of lysis buffer (50 mM Tris/HCl pH 7.5; 1 mM EDTA; 0.5% NP40; 10% glycerol; 300 mM NaCl). The lysate was cleared by centrifugation at 8000 g for 10 min and then incubated with 200 μl of washed and buffer equilibrated anti-Flag magnetic beads ( Sigma-Aldrich, St. Louis, MO ) for 2 hr at 4°C. The beads were washed once with lysis buffer and three times with washing buffer (20 mM Tris/HCl pH 7.5; 0.5 mM EDTA; 0.1% tween; 10% glycerol; 150 mM NaCl; 5 mM MgCl2; 0.5 mM PMSF; 1X Complete Mini EDTA‐Free (Roche, Switzerland); 1X PhosSTOP (Roche)). Proteins were eluted with 5 bed volume of elution buffer (20 mM Tris/HCl pH 8; 0.5 mM EDTA; 0.1% tween; 10% glycerol; 150 mM NaCl; 5 mM MgCl2; 0.5 mM PMSF; 1X Complete Mini EDTA‐Free (Roche); 1X PhosSTOP (Roche); 100 μg/mL Flag peptide) for 1 hr at 4°C. Proteins were separated by SDS-PAGE, stained with colloidal blue, and 7 bands covering the entire lane were excised for each sample. In-gel digestion was performed overnight by using trypsin (Gold, Promega, Madison, WI). Peptides extracted from each band were analyzed by nanoLC-MS/MS using an Ultimate 3000 system (Dionex, Thermo Scientific, Waltham, MA ) coupled to a LTQ-Orbitrap XL mass spectrometer (Thermo Scientific). Raw spectra were processed using Mascot through Proteome Discoverer (version 1.4, Thermo Scientific) and further analyzed in myProMS (Poullet et al., 2007). Data was searched against a Swissprot fasta database containing S. cerevisiae sequences. Only proteins found in two experiments and not in the control IPs were considered candidates. 6.108 cells were harvested, washed one time with PBS, and lyzed in 1.5 ml lysis buffer (20 mM HEPES/KOH pH7.5; 150 mM NaCl; 0.5% Triton X-100; 10% Glycerol; 1 mM MgCl2; 2 mM EDTA; 1 mM PMSF; 1X Complete Mini EDTA‐Free (Roche); 1X PhosSTOP (Roche); 125 U/mL benzonase (Sigma)) and glass beads three times for 30 s in a Fastprep instrument (MP Biomedicals, Santa Ana, CA). The lysate was cleared by centrifugation at 13,000 g for 5 min. 25 μl of Protein G magnetic beads (New England Biolabs, Ipswich, MA) (equilibrated 1:1 with lysis buffer) and primary antibodies (5 µg of mouse monoclonal anti-FLAG antibody M2 (Sigma), 3 μg of c‐Myc monoclonal antibody 9E10 (Santa Cruz, Dallas, TX) or 5 μg of HA monoclonal antibody 16B12 (Covance, Princeton, NJ)) were added. The tubes were incubated overnight at 4°C. The magnetic beads were washed four times with 1 mL of wash buffer (20 mM HEPES/KOH pH7.5; 150 mM NaCl; 0.5% Triton X-100; 5% Glycerol; 1 mM MgCl2; 2 mM EDTA; 1 mM PMSF; 1X Complete Mini EDTA‐Free (Roche); 1X PhosSTOP (Roche)) and resuspended in 30 μl of 2xSDS protein sample buffer. The beads were heated at 95°C for 10 min and loaded in duplicate or triplicate onto a 4–12% SDS-polyacrylamide gel. The proteins were then blotted to PVDF and probed for Flag, HA or Myc-tagged protein with corresponding antibodies. Signal was detected using the SuperSignal West Pico Chemiluminescent Substrate (ThermoFisher). For each meiotic time point, 2.108 cells were processed as described (Borde et al., 2009), with the following modifications: lysis was performed in Lysis buffer plus 1 mM PMSF, 50 μg/mL Aprotinin and 1X Complete Mini EDTA‐Free (Roche), using 0.5 mm zirconium/silica beads (Biospec Products, Bartlesville, OK). We used 2 µg of the mouse monoclonal anti-FLAG antibody M2 (Sigma) and 30 µL Protein G magnetic beads (New England Biolabs) or 1.6 μg of c‐Myc monoclonal antibody (9E10, Santa Cruz) and 50 µL PanMouse IgG magnetic beads (Thermo Scientific). Quantitative PCR was performed from the immunoprecipitated DNA or the whole‐cell extract using a 7900HT Fast Real‐Time PCR System (Applied Biosystems, Thermo Scientific) and SYBR Green PCR master mix (Applied Biosystems) as described (Borde et al., 2009). Results were expressed as % of DNA in the total input present in the immunoprecipitated sample and normalized to the negative control site in the middle of NFT1, a 3.5 kb long gene. Primers for GAT1, BUD23, HIS4LEU2 and NFT1 have been described (Brachet et al., 2015; Sommermeyer et al., 2013). The ERG1 primers had the following sequence: Forward, 5’ GCAACACATGGACCGATAACAC 3’ and reverse, 5’ GCCGACAACACAATTACCTACGA 3’. The MLH2 gene was amplified from SK1 and cloned into pFB-MBP-MLH3-His (Ranjha et al., 2014) to make pFB-MBP-MLH2-his by following the same cloning procedure as was used in the preparation of pFB-MBP-MLH3-His (Ranjha et al., 2014). To prepare pFB-8xHis_MLH1, we amplified a region in the promoter area before GST sequence from pFB-GST-MLH1 plasmid (Ranjha et al., 2014) using forward primer pFB_his_F and reverse primer pFB_his_R. The reverse primer carried 8x histidine gene sequence. The amplified product was cloned into pFB-GST-MLH1 using EcoRV and BamHI restriction enzymes. This introduced 8xhis tag before the MLH1 gene creating pFB-8xHis-MLH1. The MER3 cDNA was amplified from SK1 and cloned into pFB-MBP-MLH3-His, replacing MLH3 gene to create pFB-MBP-MER3-His plasmid. mer3R893E and mer3K167A mutations were introduced into the pFB-MBP-MER3-His plasmid by site-directed mutagenesis. The His-Mlh1 and MBP-Mlh2 proteins were co-expressed as a heterodimer in Sf9 insect cells and purified similarly to Mlh1-Mlh3 (Ranjha et al., 2014). The protein obtained was around 1 mg from 1 L culture that resulted in a concentration of 6 μM. Mer3, Mer3R893E and Mer3K167A proteins were also expressed and purified using the same method, and the total yield of purified proteins were ~0.2 mg from 2.4 L culture and the protein concentrations were 1.5 μM each. RPA was purified as described before (Kantake et al., 2003). Structures such as ssDNA, dsDNA, Y- Structure, HJ, Nicked HJ and Open HJ were prepared as described previously (Ranjha et al., 2014). D-loop I, D-loop II and bubbled DNA were prepared essentially as described before with details of minor modifications available on request (Opresko et al., 2004). The binding assays for Mer3 was carried out in 15 μl volume in Tris acetate, pH 7.5, 1 mM DTT, 100 μg/ml BSA, 1.3 ng/μl poly(dI-dC) (competitor DNA, 20 fold molar excess in nucleotides) and DNA substrate (0.5 nM, in molecules). The reactions also contained either 2 mM magnesium (+Mg2+) or 3 mM EDTA (–Mg2+). The reactions were assembled on ice and incubated at 30°C for 30 min. At the end of incubation, 5 μl of binding dye (50% glycerol and 0.25% bromophenol blue) was added to each sample. The products were separated on native 4% polyacrylamide gels (acrylamide: bisacrylamide 19:1) at 4°C. For Mlh1-Mlh2 binding, the reactions were done in the same manner as Mer3 but without competitor DNA and in the presence of 2 mM magnesium (+Mg2+). After separation, the gels were dried and exposed to storage phosphor screens (GE Healthcare). The screens were scanned using Typhoon FLA 9500 (GE Healthcare) and quantified by Image Quant software. Helicase assays were conducted as described before (Nakagawa and Kolodner, 2002b). 1 nM DNA substrate (in molecules) was used in all experiments. Reactions were assembled on ice, initiated by adding Mer3 and incubated for 30 min at 30°C. The reactions were then stopped with 5 μl of stop solution containing 150 mM EDTA, 2% SDS, 30% glycerol, 0.25% bromophenol blue and 1 μl Proteinase K (14–22 mg/ml, Roche) for 15 min at 30°C. The products were separated by electrophoresis on 10% polyacrylamide gel (acrylamide: bisacrylamide 19:1, Biorad) at room temperature. Gels were dried and quantified as above. The nuclease assays were performed as described before (Ranjha et al., 2014). The products were analyzed on 1% agarose gels, post-stained with Gel Red and imaged on a UV illuminator. For the protein interaction assays, MBP-Mlh2-Mlh1, MBP-Mlh2 or GST-Mlh1 were expressed in Sf9 cells. The cells were lysed with lysis buffer (50 mM Tris-HCl, pH 7.5, 325 mM NaCl, 1 mM DTT, 1 mM EDTA, 30 μg/ml leupeptine, 1 mM phenylmethylsolfonyl fluoride and 1:400 (v/v) Sigma protease inhibitory mix [P8340]) and MBP-Mlh2-Mlh1 or MBP-Mlh2 proteins were immobilized on amylose resin (New England Biolabs), or GST-Mlh1 was immobilized on gluthatione resin (Qiagen, Germany). The resin was washed with wash buffer (50 mM Tris-HCl, pH 7.5, 80 mM NaCl (or as indicated), 0.2% NP40 detergent, 2 mM EDTA and 1:1000 (v/v) Sigma protease inhibitor mix [P8340]) and incubated for 60 min at 4°C with 2.5 μg of recombinant Mer3 protein. The resin was washed five times batchwise with wash buffer and Mer3 was eluted with 100 μl wash buffer containing 20 mM maltose (Sigma-Aldrich) in amylose pulldown, or 20 mM gluthatione (Amresco, Solon, OH) in GST pulldown. The MBP or GST tag was then cleaved by addition of prescission protease. The samples were separated by 10% SDS-PAGE and visualized by silver staining or Western blot (anti-His; A00186-100; GenScript; 1:2500 and anti-MBP; E8038S; New England Biolabs; 1:8000). Genomic DNA from the eight meiotic products of single meioses was prepared using Qiagen Genomic-tip 100 kit, and sequenced using an Illumina HiSeq 2500 instruments. We studied four wild-type octads, two mlh2∆ meioses, two complete mer3R893E octads, one mer3R893E octad where the sequence of only seven cells was retrieved. We used the two complete octads for tracts lengths and interference, and the three octads for mean CO numbers. For mer3K167A and mer3167A mlh2∆, we studied two octads of each genotype. To infer recombination events from octad sequences, we first established a list of 74,911 SNPs by aligning the S288C chromosomes to the SK1 chromosomes using LAGAN (Brudno et al., 2003). Indels were not considered, and all positions located in LTR, retrotransposons and telomeres were discarded. We used the sequences from SGD for S288C (S288C_reference_genome_R64-1-1_20110203) and the sequence made by Scott Keeney’s lab (http://cbio.mskcc.org/public/SK1_MvO/) for SK1. Next, sequencing reads from octad were aligned on the S288C and SK1 reference sequences using the BWA software (Li and Durbin, 2009) to genotype SNPs and deduce recombination events. Only perfectly matching reads to the reference sequences were taken into account. The average sequencing depth was 70X. The SNP genotype was considered as valid when there was one type of reads only (S288C or SK1) and if the number of reads was comprised between 15 and 150, or when there was two types of reads if the most abundant was comprised between 40 and 150 and the less abundant was below 5. Deduction of strand transfers events were performed largely as in (Martini et al., 2011). Events that were separated by less than 1.5 kb were considered to have arisen from the same DSB and were therefore combined. The strength of crossover interference was estimated from the distribution of inter-CO distances by maximum-likelihood fitting of gamma distribution (using fitdistr from R MASS package). The shape parameter γ of the best fitted gamma distribution is indicative of the strength of CO interference (γ = 1: no interference, γ > 1: positive interference, higher γ: stronger interference) (Anderson et al., 2011). Raw sequence data have been deposited in the NCBI Sequence Read Archive (http://www.ncbi.nlm.nih.gov/Traces/sra/) under the accession number: SRP075437. Cytogenetic and Genome Research 107:180–190. Journal of Biological Chemistry 282:2976–2986. Annals of the New York Academy of Sciences 1267:95–102. Nature Structural & Molecular Biology 20:461–468. Cold Spring Harbor Perspectives in Biology 7:a016618. Journal of Biological Chemistry 282:37181–37190. Methods in molecular biology 557:117–142. Journal of Biological Chemistry 277:28019–28024. Molecular and Cellular Biology 22:3281–3291. Journal of Biological Chemistry 289:5674–5686. Journal of Biological Chemistry 289:5664–5673. Journal of Biological Chemistry 274:32368–32375. Molecular and Cellular Biology 19:3177–3183. Journal of Cell Science 122:2055–2063. Thank you for submitting your article "Concerted action of the MutLβ heterodimer and Mer3 helicase regulates the global extent of meiotic gene conversion" for consideration by eLife. Your article has been reviewed by three peer reviewers, including Hannah L Klein (Reviewer #3), and the evaluation has been overseen by a Reviewing Editor and Kevin Struhl as the Senior Editor. The manuscript provides a novel function for the Mlh1-Mlh2 (MutLβ) heterodimer, a conserved protein complex whose primary function has, to date, remained elusive. It shows that Mlh1-Mlh2 interacts with Mer3, a meiosis-specific helicase previously implicated as having crossover-promoting function, and that the two work together to limit the length of heteroduplex tracts formed during meiotic recombination in a manner that appears to be largely independent of Mer3 helicase activity. Because all proteins in this study are conserved in many eukaryotes, including mammals, it is highly likely that these findings will be of general applicability. A reorganization and better introduction of the key facts are needed, the paper would benefit from having all in vitro interaction data presented in one place so that direct comparisons can be made or model recombination substrate interaction data should be presented independent of meiotic data. In addition, you should consider having someone not immediately in the field read the manuscript to make sure that the big picture and the flow of the data are easy to understand. The following suggestions should also be attended in a revised manuscript. Understanding the larger aspects of the paper are difficult for the non-specialist. A cartoon figure of meiotic recombination and segregation at the beginning would help. For example, in the first two paragraphs of the Introduction, it is not easy to follow how recombination shuffles parental genomes through COs and NCOs or how these concepts extend to allelic shuffling, transmission distortion or gene conversion tract length, few lines later. 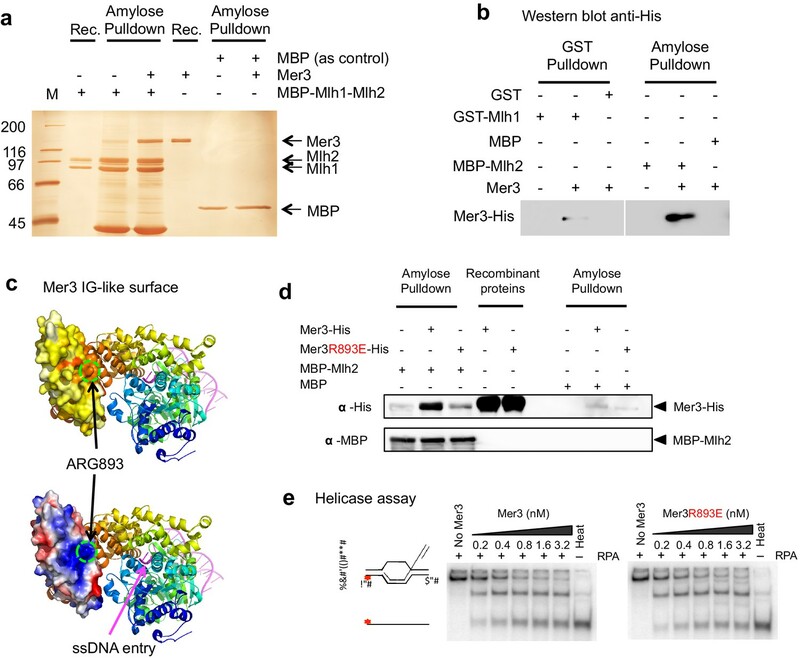 Interaction between Mer3 and Mlh1 or Mlh2 is well-documented, but not with the intact Mlh1-Mlh2 complex, even though purification of this complex is documented. Demonstrating this interaction should be the primary in vitro interaction data presented. While the paper presents the Mer3-MutLβ interaction as being mediated through Mlh2, it is clear from the in vitro data (Figure 2D, Figure 3C) that Mlh1 is also capable of interacting with Mer3, although with lower affinity. This needs to be more even-handedly discussed in the paper text. Yeast two-hybrid data will be better interpreted if they are not scattered throughout different supplementary figures and the standards to define an interaction are the same throughout the manuscript. For example, in Figure 2—figure supplement 1A, limited growth on -His plates and none on -His -Ade is taken as a signal of a significant interaction, while later (in Figure 4—figure supplement 1A) the relevant assay seems to have shifted towards whether or not growth occurs on -His -Ade. There's much more focus on 2-hybrid assays using Mlh1 and Mer3 than on Mlh2 and Mer3, even though authors argue that Mlh2 is responsible for bridging between Mlh1 and Mer3. All two-hybrid data should be presented in a single place and two-hybrid experiments should be presented in parallel with internal standards (for example, including Mlh2 + Mlh1 on every plate). 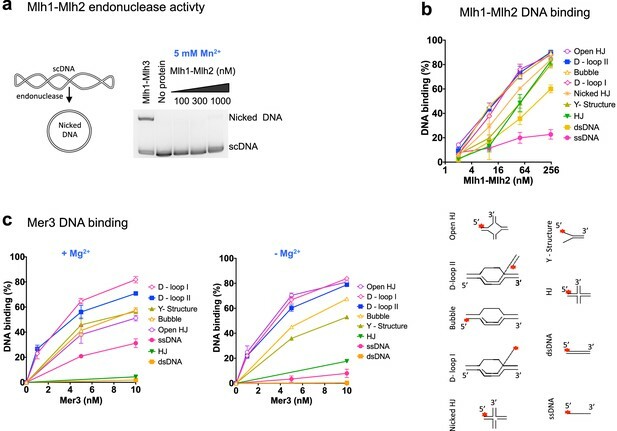 Analysis of Mlh1-Mer3 and Mlh2-Mer3 interactions would be greatly strengthened if experiments were done in mlh2- and mlh1- mutants, to directly test bridging interactions. The model intermediate-binding activity of MutLβ is quite weak, as compared to Mer3, and only poorly discriminates model recombination intermediates from dsDNA. It's hard to directly assess this, since the critical data for MutLβ (at 10nM) is obscured by the plot in Figure 4F. This can be solved doing the following: 1) present graphs of MutLβ and Mer3 binding together in one figure, along with the cartoons of the model substrates, but move the actual gels to a supporting figure; 2) use either a log or split-X axis, so that data for 10nM can be clearly discerned; 3) don't assign Kd values to the interaction between MutLβ and the various substrates-the current data are just too sparse-instead describe binding in relative terms. Data values in Figure 4A and C are discordant with those in panel D; the numerical values for Mer3R893E in panel C are similar to those for wild-type Mer3 in panel D. These data sets need to be reconciled, and data for mer3R893E with a mismatch at HIS4-LEU2 should be included in panel D. One possible explanation for this discordance is the use of the NFT1 locus, which is not expected to bind Mer3 or MutLβ, as "normalization" standard, which means that all values are "normalized" to a background value that might be vulnerable to experimental variation. What happens if un-normalized (i.e. just Mlh2-ChIP/input) is used? Data presentation for meiotic phenotypes are somewhat disorganized and confusing; given that mer3-hd is analyzed in Figure 6, it would make sense to present spore viability data for this mutant along with the other spore viability data. Data regarding partial suppression of the spore viability defect of zmm mutants, while interesting, is of limited effect and possible mechanisms are not clear; moreover, a compelling case for the phenotypic equivalence of mlh2Δ and mer3R893E is made on the basis of tetrad data alone, and the msh4 suppression data could easily be omitted without compromising the conclusions. Analysis of gene conversion and crossing over in SK1-S288c hybrids is quite compelling, but the presentation needs to include data on the mean number of noncrossovers per meiosis, and also comparison with γ values for true zmm mutants from other studies. Following this suggestion, we have reorganized the Results section, so that now the in vitro interaction data are presented in a separate figure, Figure 4. In addition, DNA binding assays of recombinant Mer3 and MutLB are now grouped, together with the MutLβ endonuclease assay in Figure 6. In addition, you should consider having someone not immediately in the field read the manuscript to make sure that the big picture and the flow of the data are easy to understand. We had the manuscript read by a cell biologist colleague and added explanatory sequences at several places in the manuscript, especially in the Introduction. The following suggestions should also be attended in a revised manuscript. As suggested, we have added an introductory Figure 1 depicting how meiotic recombination shuffles alleles, and how it can result in gene conversion. Interaction between Mer3 and Mlh1 or Mlh2 is well-documented, but not with the intact Mlh1-Mlh2 complex, even though purification of this complex is documented. Demonstrating this interaction should be the primary in vitro interaction data presented. The reviewer may have missed it, but the interaction between purified Mer3 and Mlh1-Mlh2 complex was in Figure 3B. It is now on Figure 4A, and we present it in a clearer way in the text. While the paper presents the Mer3-MutLβ interaction as being mediated through Mlh2, it is clear from the in vitro data (Figure 2D, Figure 3C) that Mlh1 is also capable of interacting with Mer3, although with lower affinity. This needs to be more even-handedly discussed in the paper text. We have added additional evidence that Mer3 interacts directly with Mlh1 by showing that the 2 hybrid interaction between Mer3 and Mlh1 still occurs in the absence of Mlh2. This and the evolutionary conservation of this interaction is now more extensively discussed (see response to reviewer comment below). We group our answer to the last three comments. We have added in Materials and methods a sentence defining “interaction”: "interaction is defined compared to the growth seen in the negative control consisting of the combination between the GAL4BD-bait protein in the presence of GAL4AD-only (“empty” on the figures). Any combination that grows better than this control on the selective media is considered as an interaction". In addition, to compare individual experiments, we have added the interaction between Mlh1 and Mlh3 as an internal standard in each experiment. This is seen in Figure 4—figure supplement 2 and Figure 4—figure supplement 3. This is a great suggestion, and indeed we have tested two hybrid interaction between Mlh1 and Mer3 in a mlh2∆ mutant, and two hybrid interaction between Mlh1 and Mer3R893, defective in the interaction with Mlh2. We still see an interaction between Mlh1 and Mer3, meaning that the two hybrid interaction is not mediated by Mlh2, in agreement with the direct interaction between recombinant proteins. The model intermediate-binding activity of MutLβ is quite weak, as compared to Mer3, and only poorly discriminates model recombination intermediates from dsDNA. It's hard to directly assess this, since the critical data for MutLβ (at 10nM) is obscured by the plot in Figure 4F. This can be solved doing the following: 1) present graphs of MutLβ and Mer3 binding together in one figure, along with the cartoons of the model substrates, but move the actual gels to a supporting figure. As suggested, we have moved the Mer3 binding data to the main manuscript, and this data is presented next to MutLβ DNA binding for direct comparison (Figure 6). 2) Use either a log or split-X axis, so that data for 10nM can be clearly discerned. We have changed the scale of the X axis to a log scale, which makes all concentrations easy to distinguish (Figure 6B). 3) Don't assign Kd values to the interaction between MutLβ and the various substrates-the current data are just too sparse-instead describe binding in relative terms. The experiments done in Figures 5C and E (previously Figure 4) were done in parallel (2 independent sets of WT and mutant) with the same lot of antibody, whereas the set of experiments presented in Figure 5F were done later, with a different lot of antibody. We believe this is the cause of the discrepancy between the two panels. As suggested, we have added Mlh2 ChIP data in the mer3R893E strain that has a mismatch at HIS4LEU2 in panel 5F. This allows reproducing a similar decrease in Mlh2 binding compared to MER3, as the one seen in panels 5C and 5E. We thank the reviewer for this suggestion. We have moved all the meiotic progression and spore viability data of the mer3-hd mutant to the current Figure 7 (previously Figure 5). Data regarding partial suppression of the spore viability defect of zmm mutants, while interesting, is of limited effect and possible mechanisms are not clear; moreover, a compelling case for the phenotypic equivalence of mlh2Δ and mer3-R893E is made on the basis of tetrad data alone, and the msh4 suppression data could easily be omitted without compromising the conclusions. The phenotypic equivalence between mlh2Δ and mer3R893E is also based on the similar delay in meiotic divisions, as well as the increase of spore viability of zmm mutants. We felt that the msh4 data reinforce the findings seen for zip4, another zmm mutant, and we decided to keep both sets of data, which also reinforce the observation that mlh2∆ and mer3R893E phenotypes are identical. We have added, in Figure 8—figure supplement 1A, the mean number of NCO in the analyzed meioses. In the text (subsection “Mlh2 limits the extent of sequences involved in meiotic recombination intermediates through its interaction with Mer3”, first paragraph) we compare the γ values of our data to those obtained for WT and several zmm mutants in a previous study that used the same approach (Chen et al., 2008). We thank Arnaud De Muyt for critical reading of the manuscript, Bruce Fetcher, Mathilde Grelon and Deborah Bourc’his for reagents, and Nancy Hollingsworth for advice. We thank the NGS and Bioinformatics platforms of the Institut Curie. © 2017, Duroc et al.